Eros International Media Ltd (Eros International), a leading global company in the Indian film entertainment industry has announced a historic and record breaking opening for Shah Rukh Khan’s Ra.One, produced by Red Chillies Entertainments in association with Winford Productions which released across theatres worldwide on 26th October 2011. SRK’s super hero action film has set a new record at the Indian box office by earning a gross of Rs. 170 crore worldwide in the opening weekend (first five days of release). The highly anticipated Diwali release triumphed at the box office with an incredible weekend gross collection of Rs. 137.25 crore (Net Collection of Rs. 96 crore) in India and Rs. 32.75 crore overseas. 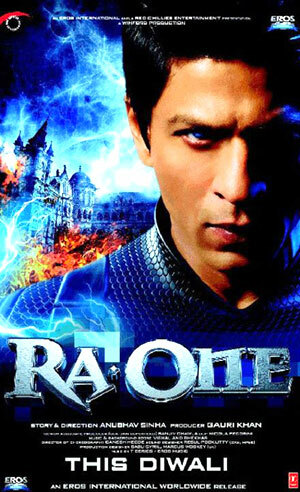 Since its release, Ra.One has been creating history by shattering regional, national and international box office record after record with the biggest Diwali day opening followed by the biggest single day collections for an Indian film and now the biggest ever weekend release for both India and overseas box office. Ra.One opened across more than 4,000 plus screens worldwide (3,100 plus screens in India and 904 prints internationally, including 3D, Tamil and Telugu) and is the biggest Hindi grosser in south markets too. Commenting on the opening, Nandu Ahuja, Sr. VP, Distribution, Eros International Media Ltd said, “Ra.One released to packed houses across the country on Diwali day and has already created history by taking over the mantle of the biggest domestic earner so far. The film continues to be on its record breaking spree with several new achievements since its release. It has touched the highest individual collection in circuits such as Mumbai, Delhi, Punjab and Rajasthan. We see repeat viewings of the movie with the 3-D version being equally sought after. With the Eid holiday also coming up next week and no other major film release; we are anticipating the film to continue doing huge numbers”. Speaking on Ra.One’s overseas performance, Pranab Kapadia, President – Distribution – Eros International plc said, “With Ra.One, Eros International once again consolidates and establishes its global distribution network and the film is enjoying a superb run across all major regions including UK, North America, Europe, Australia and the Middle East. Overseas, the film has broken SRK’s own previous first weekend record established by My Name is Khan and Ra. One now occupies the position of biggest Indian first weekend grosser overseas as well. The Saturday release of 3D versions in most overseas markets means that we are looking at the film continuing to do some excellent numbers through the coming weeks”. Ken Naz, President, Eros International, USA added, “Eros has capitalized on its key competitive advantage of its worldwide distribution network to exploit the film and not surprisingly, Ra.One has had a brilliant opening across the country. Despite storms in the east coast and a state of emergency declared, the film has performed so well. Apart from audience appreciation, leading media like the New York Times and LA Times have hailed the film too and we can confidently declare this film to be one of the biggest ever blockbusters and top earners for an Indian film in the USA”. Kamal Jain, Group CFO, Eros International Media Ltd said, “As well as setting new box office records, Ra.One has also been able to set a new benchmark in terms of brand tie ups and merchandising. With Volkswagan, McDonalds, PlayStation and Tag Heur amongst its partners it has opened up a whole new areas of funding and cross promotion. Through pre-licensing of rights and the strong theatrical advances and collections till date, we have already recovered our investment. The financial success of Ra.One demonstrates the efficacy of our movie monetization model and the unparalleled strength of our marketing and distribution network both in India and globally. We are very glad with the results posted by Ra.One and it is a profitable venture and the performance is as per our expectations”. The international exposure of Ra.One will continue to grow in the coming months as Eros International continues to take the film to more and more countries. The film is scheduled for theatrical release in the first quarter of 2012 across several territories including South Korea, Hong Kong, Taiwan, Russia , Lebanon, Jordan, Syria, Palestine, Brazil, Spain, Italy and Greece. Ra.One is Shah Rukh Khan’s most ambitious project to date directed by Anubhav Sinha starring King Khan himself as G.One along with Arjun Rampal as Ra.One and Kareena Kapoor. The film’s visual effects and state of the art production techniques have set a new standard in Indian film. All this, combined with a widely acclaimed soundtrack produced by Vishal & Shekhar and featuring Grammy award nominee Akon, have made Ra.One a must see film. For Eros, the success of Ra.One is part of its ongoing slate of film releases. In the current financial year it expects to release over 70 Indian films with high profile releases to date including Ready, Murder 2, Zindagi Na Milegi Dobara and Mausam. The line-up for the remainder of the financial year continues to look very attractive with three major releases still to come – Imtiaz Ali’s Rockstar, Rohit Dhawan’s Desi Boyz and Shriram Raghavan’s Agent Vinod.